Garth Algar: How can you sleep like that? Del Preston: Listen, sonny Jim. Sleeping like this will add ten years to your life. I learned it from Keith Richards when I toured with the Stones. This may be the reason why Keith cannot be killed by conventional weapons. Something absolutely awful has happened. 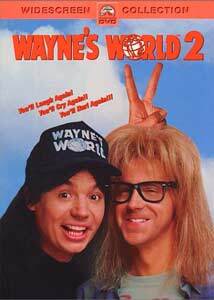 Through the wizardry of the Hollywood filmmaking process, the makers of Wayne's World 2 have made the wrong movie. With the main cast and writers returning from the overly original and often humorous Wayne's World, a sequel should have carried over the best traits from the first film. It sadly wasn't to be, instead Wayne's World 2 plays a lot like an exact mirror image of the first film, down to several plot points. This is a shame, because Wayne's World 2 is at times hilarious, but the recycled moments fail to generate the laughter they did the first time around. Set a year after the events in the original picture, both Wayne (Myers) and Garth (Carvey) are out of their parent's house and living on their own in an abandoned warehouse. As would be expected, both Wayne and Garth have no idea what to do with their lives, when they aren't busy with their popular cable access show, Wayne's World. When Wayne has a dream, which features among other things a half-naked Indian and the late Jim Morrison, his mission in life becomes clear. He will book, promote, and sponsor an all-day music festival titled Waynestock. While his professional life seems stable for the moment, he feels as though he is losing his longtime love Cassandra (Carrere) to a slimy music producer (Walken). Garth's love on the other hand is in full bloom as he starts an affair with Honey Hornee (Basinger), which soon leads Garth to proclaim that he is "no longer a stranger to the ways of the woman". Unfortunately, Walken's role as the slimy industry type lusting after Cassandra is nothing more than an imitation of the Rob Lowe character from the first picture, and even the multiple ending joke is redone with less success. On the other hand, parodies of kung fu films, the Village People, and The Graduate each provide many laughs and are arguably as funny as anything in either film. In the end it's just frustrating that despite a few far between laugh out loud moments, Wayne's World 2 could have been so much better. Perhaps Myers should have taken the time to flesh out his screenplay instead of rushing into production on the film only six months after the first was released. Director Stephen Sujrik, whose Kids In The Hall skits are among that show's funniest, took over the directing reigns for Wayne's World 2, and aside from a few stumbles he does a fine job. Sujrik keeps the pace moving along so that the audience doesn't lose interest. Christopher Walken, as should come as no surprise, is typically fantastic as record producer Bobby Cahn. Charlton Heston, Drew Barrymore, Rip Taylor, and Kim Basinger each give nice, funny performances. The success of the first film rested squarely with the fact that both Myers and Carvey often shared the screen, but in Wayne's World 2there are very few moments that the duo are seen together. Wayne's World 2 isn't a horrible movie, just unoriginal. In it's favor it can be said, however, it is better than 99% of the other Saturday Night Live skits turned into feature films. Image Transfer Review: Wayne's World 2 boasts what can best be described as an amazing anamorphic transfer. Colors are vibrant and well transfered, although at times they appear a bit soft. Black levels are very good with great depth, and detail and sharpness are excellent. Edge enhancement is evident on more than one occasion, although not overly distracting. Audio Transfer Review: With a remixed Dolby Digital 5.1 soundtrack Wayne's World 2 doesn't break new ground, yet there are more than a few moments that defy the normal constraints of a comedy soundtrack. Surround effects are limited to mainly music or ambient effects, with only one moment in chapter 12 that shows off the split surrounds. Dialogue is fine and easy to understand, while the .1 LFE channel has some nice moments with the rock heavy soundtrack. A Dolby 2-channel mix is also available in English and French. Extras Review: Much like the new DVD release of the original Wayne's World, Waynes World 2 features a nice selection of extras. First up is a new audio commentary track by director Stephen Surjik. Surjik's comments on the film are limited to small scene-specific anecdotes, which never allows him to delve into more interesting matters. As his first feature film it would have been great to hear his thoughts on the pressure of the sequel or even about working with the actors and having to appeal to a built-in fan base. Although he does discuss how he went about trying to add his own brand on the film, the track left me thirsting for more information. Several moments of silence don't help the track either. Extreme Close Up is a short documentary that features interviews with Myers, Carvey, producer Lorne Michaels, Carrere, and Surjik. Overall this is a step better than the typical extended trailer making-ofs. Strangely the films theatrical trailer is nowhere to be seen, although by way of some very amusing menu screens there are advanced looks at other Paramount releases including I Love Lucy and Solid Gold Workout. Funny stuff. With a nice image and audio transfer, and a small but nice selection of extra features, Paramount has done a nice job with Wayne's World 2. It has it's faults, but I still recommend it.